Prior to this implementation, overworking your colonists had very little downside; we were still trying to figure out how to balance the system of unhappy characters inhibiting work. While probably technically possible, none of the solutions to this approach that we tried struck a good balance between player feedback and reliable behavior. And oftentimes it’d just lead to frustration, as for example if your carpenter randomly halted work on planks to go kick landmines because he wasn’t happy, this would feel like arbitrary punishment because it wasn’t closely connected to a cause or particularly well communicated why this was happening now and not some other time. The current implementation still has some issues that need to be worked out. For one, since happiness and anger have not been so directly plugged into the game state until now, they’re a bit unbalanced, and as a result we need to tweak some of the memory values to make the characters a bit more stable over the next few patches. 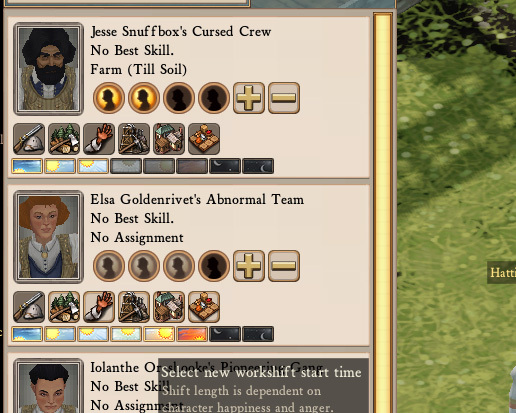 We also need to place a confirmation box on the shift change so players don’t accidentally make all of their workers revolt by just clicking them without any concept of the consequences, and we need to be a bit more clear about what exactly is going on in the UI for players who haven’t seen this system yet. Pictured: example of a Not Happy colony. I’m super excited about what this feature is going to mean though. 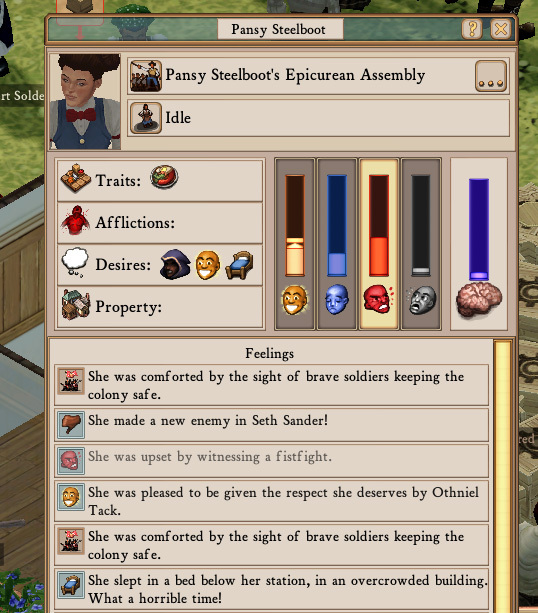 Finally we’re tapping into the character simulation to affect the economic simulation in a really meaningful way, and players are actually motivated to make colonists happy, which means progressing through to the more sophisticated construction options, luxury foods, and other more advanced systems. This will also tie in pretty heavily with the occult rework that is in the pipeline now, so if your characters seem a little too happy, don’t worry. If colonists become to happy they join the Happy Happy Cult and paint your town blue, which results in everyone who isn’t in the cult (or has a favourite colour other than blue) to revolt. This is a perfectly reasonable event that cannot spiral out of control so why not implement it? Heh. A Huxley reference. Nice. Otherwise, well, mostly I like this, but as always I worry about food. My Cooks already provide food at a strange and unreliable rate, and I fear that this will increase my chances of entering the dreaded Cannibalistic Death Spiral.